Java Memory Management, with its built-in garbage collection, is one of the language&apos;s finest achievements. It allows developers to create new objects without worrying explicitly about memory allocation and deallocation, because the garbage collector automatically reclaims memory for reuse. This enables faster development with less boilerplate code, while eliminating memory leaks and other memory-related problems. At least in theory. Ironically, Java garbage collection seems to work too well, creating and removing too many objects. Most memory-management issues are solved, but often at the cost of creating serious performance problems. Making garbage collection adaptable to all kinds of situations has led to a complex and hard-to-optimize system. To wrap your head around garbage collection, you need first to understand how memory management works in a Java Virtual Machine (JVM). Many people think garbage collection collects and discards dead objects. In reality, Java garbage collection is doing the opposite! Live objects are tracked and everything else designated garbage. As you&apos;ll see, this fundamental misunderstanding can lead to many performance problems. Object creation is faster because global synchronization with the operating system is not needed for every single object. 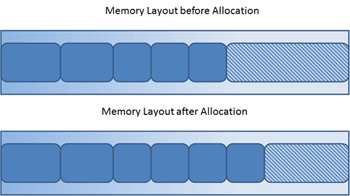 An allocation simply claims some portion of a memory array and moves the offset pointer forward (see Figure 2.1). The next allocation starts at this offset and claims the next portion of the array. Figure 2.1: New objects are simply allocated at the end of the used heap. Every object tree must have one or more root objects. As long as the application can reach those roots, the whole tree is reachable. But when are those root objects considered reachable? 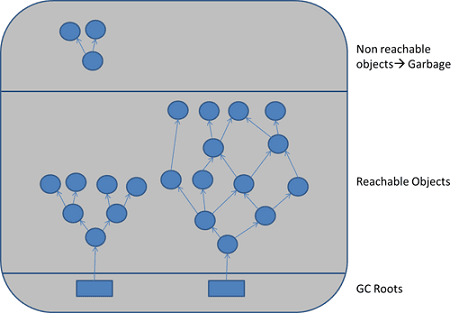 Special objects called garbage-collection roots (GC roots; see Figure 2.2) are always reachable and so is any object that has a garbage-collection root at its own root. Static variables are referenced by their classes. This fact makes them de facto GC roots. Classes themselves can be garbage-collected, which would remove all referenced static variables. This is of special importance when we use application servers, OSGi containers or class loaders in general. We will discuss the related problems in the Problem Patterns section. JNI References are Java objects that the native code has created as part of a JNI call. Objects thus created are treated specially because the JVM does not know if it is being referenced by the native code or not. Such objects represent a very special form of GC root, which we will examine in more detail in the Problem Patterns section below. 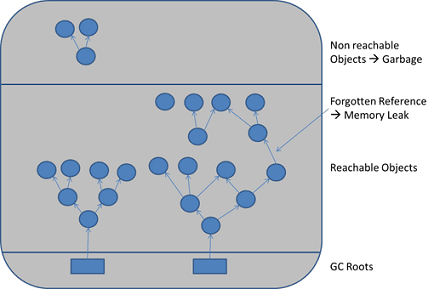 Figure 2.2: GC roots are objects that are themselves referenced by the JVM and thus keep every other object from being garbage-collected. Garbage collection is intended to remove the cause for classic memory leaks: unreachable-but-not-deleted objects in memory. However, this works only for memory leaks in the original sense. It&apos;s possible to have unused objects that are still reachable by an application because the developer simply forgot to dereference them. Such objects cannot be garbage-collected. Even worse, such a logical memory leak cannot be detected by any software (see Figure 2.3). Even the best analysis software can only highlight suspicious objects. We will examine memory leak analysis in the Analyzing the Performance Impact of Memory Utilization and Garbage Collection section, below. Figure 2.3: When objects are no longer referenced directly or indirectly by a GC root, they will be removed. There are no classic memory leaks. Analysis cannot really identify memory leaks; it can only point out suspicious objects.